Easily covers small floor gaps, cracks and joints. Easily rolls out over travel path to cover small floor gaps, cracks, and joints. No danger of corrosion outdoors. 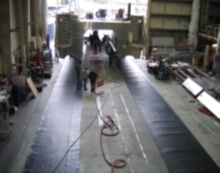 Roll out over long sections of porous surfaces without taping seams as with smaller sized sheets. Lighter and easier to handle than sheet metal. Using 4’ x 8’ polystyrene sheets this manufacture moves its 40-ton concrete structures through the assembly process. Using a series of 4’ x 8’ overlays this installation crew moves a 30-ton chiller from a temporary metal deck to its permanent concrete foundation. 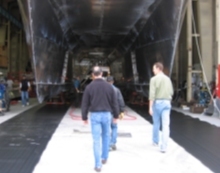 On two 100’ long x 60” wide polyethylene roll-out overlays, this manufacturer moves a 100-ton catamaran ship hull out of the assembly plant. Made from proprietary resins, specifically designed for strength & durability. Outstanding strength and stiffness properties. Demonstrated ability to withstand the rigors of direct exposure to the sun and ultraviolet light. Note: Polystyrene and Polyethylene rolls are available in 22.5’ wide x hundreds of feet long with varying thicknesses up to 80-mils. A cutting charge will apply on narrow rolls.